Today I read a slightly different take on the issue in the 14 December edition of the BBC’s “Green Room,” its page of op-eds on environmental issues. 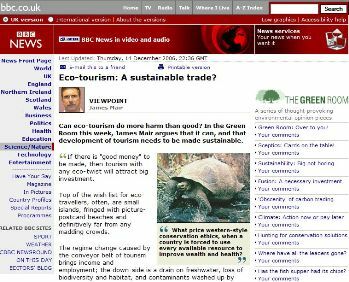 Dr. James Mair of the Centre for Marine Biodiversity and Biotechnology at Heriot-Watt University in Edinburgh asks if “eco-tourism” is “a sustainable trade.” The op-ed raises some interesting issues and questions, not only for tourism generally, but for tourism regarding small islands in Latin America and the Caribbean (LAC) in particular. I have a few problems with the opinion piece, not the least of which is that he freely utilizes the term “eco-tourism” without ever defining it. In my experience there are dozens of different definitions of “eco-tourism,” and no real consensus on just what that encompasses. How can we determine if something is sustainable without first agreeing on which “something” we’re examining. I find “eco-tourism” too vague and much abused and distorted, which is why I (like Jaime) tend to focus instead on “sustainable” tourism. The regime change caused by the conveyor belt of tourism brings income and employment; the down-side is a drain on freshwater, loss of biodiversity and habitat, and contaminants washed up by seasonal waves or continuous tides of visitors. Jaime discusses the same tension between coastal environment and tourism development in his essay. It can be seen not only on the small islands that Mair focuses on, but probably any coastal area undergoing rapid (and usually unplanned or under-planned) tourism development. Islands of the Las Perlas Archipelago (LPA) are characteristic of where tourism and conservation are in an embryonic stage. Within a two-week period in late November and early December of this year, the LPA Municipality published a decree, with government backing, for the establishment of a hydrological reserve in the largest of the islands to protect over 9,800 hectares of important watershed environments, home to 14 endemic bird species. Meanwhile the central government promulgated another decree announcing major large-scale tourist development plans. The left hand protects the ecology, the right hand builds on it. I can’t count the number of times I have seen this in play in the Dominican Republic, no matter who is in the presidential palace. All too often the Environment Minister will declare that such-and-such protected area cannot be touched by resort developers because of its status under the General Environment Law, only days later to have the President reveal that he changed the boundaries or the protected status of that area by executive decree. Many tourists who visit such places become fascinated by, and protective of, reef fish, corals, nesting turtles, migrating cetaceans, whale sharks and so on. They will often actively support conservation initiatives; but they may also be the unwitting necrotic traveling agents of change. Some truth to this. Sometimes when tourism successfully promotes conservation and ecological concerns, its success can unwittingly create new problems to the very areas people want to help or protect. It is a high wire balancing act. The sight of small islands drowning under congregations of tourists “thonging” on beaches, and others who could be termed “pleasure-seekers” with opportunistic predatory instincts already springing silently on novel niche destinations, begs the question: when will the organic growth of island eco-tourism reach its carrying capacity? An excellent question I’ve often wondered about myself. How many of the island governments have seriously attempted to calculate their carrying capacity? …has anyone asked the indigenous island peoples, with their fragile eco/social systems, what they want for themselves and their own descendants? I’m a bit puzzled by this one, at least if Dr. Mair is continuing to speak of LAC islands. How many Caribbean islands still have indigenous cultures on them? It is, however, an excellent question to pose to those mainland tourism areas where resorts, especially all-inclusives, often displace and marginalize the locals. Many economists think conservationists mean “no-development” when proposing “sustainable development”. Maybe it would be a start if both sides could try to agree at least on the definition of “unsustainable” developments. 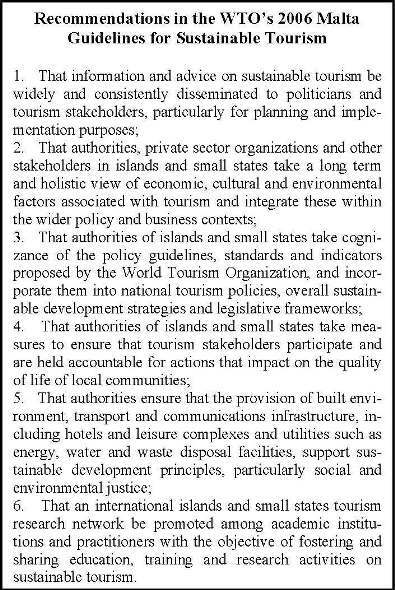 Can the “contracts” that the (possibly well-meaning but often environmentally inept) World Bank or Inter-American Development Bank come up with for what is termed development assistance “converge” with the principles of the UNWTO statement? Have the World Bank and IDB taken up the Malta Guidelines? Maybe, but I have yet to see concrete signs of it. How best to do so? That, in itself, should be the basis of a broad and deep discussion.